With the busiest time of the year for real estate and mortgages just around the corner, it’s important for mortgage lenders to pay close attention to the current average interest rate and the resulting purchase vs. refinance ratio. We pulled data from Marksman®, and took a look back at the purchase vs. refinance rate in 2014*, along with monthly average interest rate, to see some trends that occurred throughout the year. Using the infograph above as a reference, it’s clear that while interest rates had a gradual decline in the first two months of the year, the percentage of purchases went up considerably in March despite a minimal increase in the interest rate. Equally as interesting, when rates took a considerable drop from April to May, the percentage of refinances actually went down slightly. However, once rates began to fall in July, and fell consistently through all but one of the next five months, the percent of refinances and purchases moved steadily towards equilibrium, halting just low and high of 50% in December, respectively. 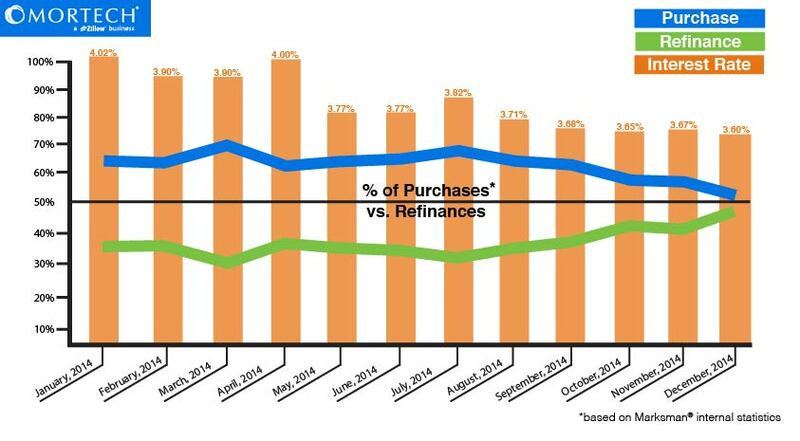 Throughout 2015 we will continue to monitor and report the purchase vs. refinance percentages and how they correlate with the current interest rate. As those rates fluctuate, it’s important to have the most accurate pricing available for your customers. Find out today how Mortech can not only provide up to date, accurate pricing, but can also equip you and your business with secondary desk tools designed to expedite internal communication during the lock process, to keep everyone on the same page. To schedule a free, consultative demo about Marksman, click here.